At the launch event, Ian Manning, MD of Stagecoach West, was joined by Cllr Julie Woodward, the Mayor of Hereford, Cllr Caroline Utting, the deputy mayor of Ross-on-Wye, Cllr Adrian Blackshaw, Herefordshire Council Cabinet member for Highways & Transportation and Cllr Mark Hawthorne, the leader of Gloucestershire County Council. 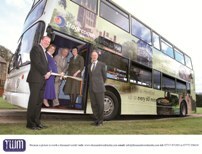 On Sunday (October 23) Stagecoach West unveiled a new hourly bus service which operates from Gloucester to Hereford. The route 33 is a revision of an old route which terminated at Ross-on-Wye, meaning passengers for Hereford had to change buses. The new route, branded the County Link, connects Gloucester and Hereford via Churcham, Huntley, Lea, Weston under Penyard, Ross-on-Wye, Much Birch and King’s Thorn. It runs hourly during the day Monday to Saturday. Stagecoach’s route 32 service has been extended to Hereford on Sundays and weekday evenings to cover the route 33 downtime. The service enhancements were supported by a wide-scale marketing campaign which saw money-saving vouchers for Routes 32 and 33 despatched to over 45,000 households along the routes. Stagecoach has also made changes to its 35 and 36 routes in its Ross-on-Wye network this month. Cllr Adrian Blackshaw, Herefordshire Council cabinet member for highways & transportation, said: “We’re delighted that Stagecoach West has committed to this new enhanced service which will make it easier for people to travel between the two counties.